The Archaeological Survey of India is doing a great job with the financial constraints they have. But once in a while they do something which makes you want to bang your head on a nearby archaeological structure. One such incident came to light when we found from whom the ASI takes instructions — Emperor Shah Jahan. The fact that the emperor has become fossil fuel hundreds of years back has no effect on the ASI. They dare not violate one of his orders, for what if he comes out of the grave. The issue is regarding the pay for the Imam who takes care of the mosque in the precints of Taj Mahal. Shah Jahan had fixed it at 15 gold ‘asharfis’ about four hundred years back. Now after adjusting for the new currency and inflation, the ASI has come up with an amount which should provide him with a posh life — Rs. 15. Yes, he gets fifteen rupees which is the amount an auto driver would charge you in Chennai if you looked at his vehicle. “The salary of the Imam was fixed in accordance with the spirit of the Mughal ‘firman’ (rules), issued by Shah Jahan, who had fixed it at 15 coins,” said an ASI official. “What else can we do, we are bound by the will of the emperor,” the official told IANS over telephone from Agra. Someone gotta break the news, gently, to the ASI official that the emperor is not going to strike back. 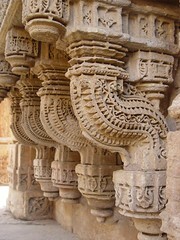 A bunch of folks have started a flickr group called Ruins of India with some amazing pictures. Please take a look and contribute if possible. The word, Palm Leaf, was chosen as it was a popular medium of writing in India for almost two thousand years. Letters were written on a dried, smoothed, smoke treated leaves of palm trees using a stylus. These were then blackened with vegetable juice and lamp black. This site hopes to be the electronic version of those palm leaves. Rajiv Malhotra in an e-mail notes that the History of Science and Technology has a new volunteer and the site has been updated with new articles. What was Hanuman’s Speed ? The mythologies are filled with people of superhuman powers. So in Ramayana we have Ravan with 10 heads and Hanuman who could fly from Lanka to the Himalayas. The fact is if such people existed, how come we don’t have 10 headed people now ? A Berkeley Professor has got interested in finding the truth behind all these symbols. Ten-headed demon king Ravana of the Hindu epic Ramayana actually had one head and the other nine were its reflection on the nine large polished gems that he wore around his neck, an American scholar of Sanskrit has reasoned. How will gems around the neck reflect the head ? And the “scientific” explanation is not on how monkeys could fly, but on how fast he could fly. I wonder what this professor teaches. Maybe the clue is Berkeley Professor. Now an archaeological dig at Sanjan is providing more information about the first Parsi settlement in India. bq. The find at Sanjan’s Varoli riverside dig includes six whole skeletons and a few partial ones, coins, pieces of pottery, glass and beads. After being analysed by paleo-anthropologist S.R. Walimbe of Pune’s Deccan College, the skeletons? which were found lying with their hands crossed and legs tied together?will be sent to Oxford University for carbon dating and DNA testing to find out if they are of Parsis. bq. Knowledge of Parsi history is only from the quasi-historical document, the ‘Kissei-Sanjan’ and from oral tradition. “We know of Parsis living in Sanjan from the 7th century (under the patronage of the Hindu ruler Jadi Rana) to the late 14th century when the place was invaded by a general of Mahmud Tughlak,” said historian Homi Dhalla, who is the president of the WZCG. bq. “But there has been little evidence to indicate when and how they had come and the events they lived through. We are excited because these finds may provide the proof we need.” Confirming this, Ms Gokhale said that five of the 32 Indian and Persian coins date back to the seventh and eighth centuries. She has also found allusions to a fire altar?the temple where a flame is kept burning as a symbol of the cycle of life and eternal recurrence?on the sole Sassanian coin, which is from the 7th century.